I live near an old industrial sign in Brooklyn that’s much beloved by many of my neighbors and myself. 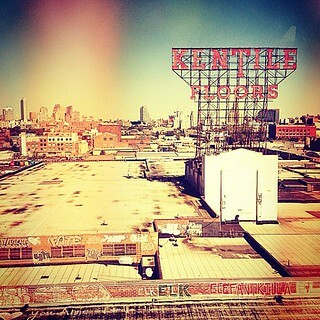 It’s the Kentile Floors sign in the Gowanus area, viewable from the F train. You could say I’m a little obsessed with it, and again, it’s a nostalgiac fixation. The sign is a rare feature in an ever-changing urban landscape that serves as a continuous link to an earlier generation. I’ve taken dozens and dozens of photos of it over the years and I’m not sure exactly what’s so meaningful to me about it. Well, after decades of dormancy, last night the sign was again alight, but in a new way. Two artists mapped the sign for projection. 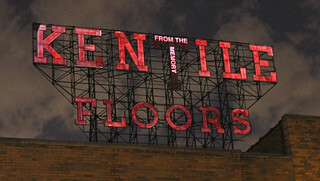 That means they used software that models the architectural features of the sign to use it as a light canvas. They incorporated moving image, patterns and text to project a collage onto the sign – and it was subtle, but magnificent. 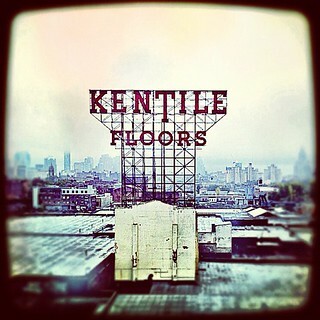 τέλειο σύμπαντος (“Perfect Universe”) is a bold resurrection of the KENTILE FLOORS sign — a beloved Gowanus icon. Inactive since 1992, this 7-story canvas is illuminated by a pair of Digital Projection DPI Titan Super Quad 20K projectors. A looping series of site-specific videos/animatics was presented from sunset onwards. The program is 30 minutes in length, and contains works by Ralph Ellison, Milan Kundera, Gabriel García Márquez & Henry David Thoreau. Here’s what the sign looked like with an element of text on it – the artists mapped all the text onto the letter “T” in the center of the sign. The net effect of the text was not really cohesive, but each of the quoted passages had its own poignancy. The light show served to reclaim the sign for a new audience, and a new purpose. The original intention of the sign was to draw attention to a business that hasn’t existed in decades. Now the sign means something else. It represents the neighborhood’s shifting identity from industrial to residential and it serves as a marker of change. The light show itself served to breathe new life into the life of the sign – there’s something historic about it. It was like a party for an old friend. Although it seems like I may be anthropomorphising inert elements of the urban landscape, we do project meaning and familiarity onto the elements of our daily landscape. I’d venture it’s an innate human feature to imbue material elements with a constructed aura. 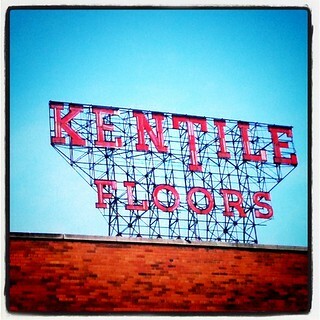 Great blog post about KenTile Floors sign. I’m sure you’ve heard, but if you haven’t, the building owner has plans to dismantle and discard this Brooklyn icon. 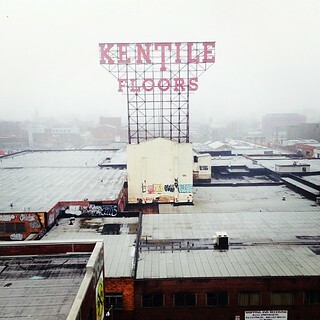 If interested, check out savekentile.com, https://www.facebook.com/saveKentile and on twitter, @savekentile and #savekentile. TOMORROW, Wednesday, June 11 @ 10:00am, there’s another rally to save the sign – on 9th street between 2nd Ave and the canal. Hope you can come down and fight the good fight.